What AT&T and other providers are required to report to the FCC on their semi-annual Form 477 reports is the maximum advertised consumer download and upload speed for each Internet technology type for each Census block. But this reported maximum speed-per-technology is not necessarily available to all or most residences in the block; in fact, it could be available to only a handful of addresses out of several dozen or more. 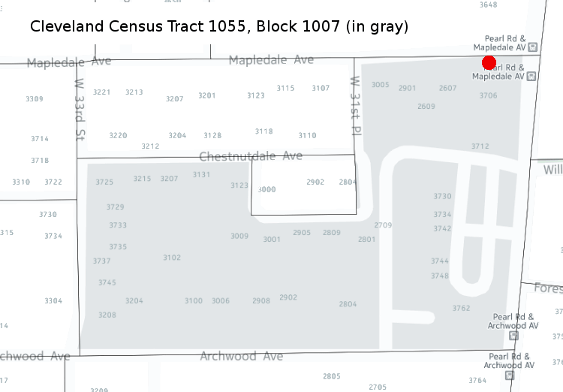 For example: Census Tract 1055, Block 1007 (where the author lives) contains at least a hundred residential units. The majority of these units are in apartment buildings, but there are about two dozen houses, some of which are duplexes. The block, located in the Brooklyn Centre neighborhood, includes the north side of Archwood Avenue from Pearl to West 33rd, most of the east side of West 33rd between Archwood and Mapledale, and fragments of two little streets called Chestnutdale and Delmar. It also includes several houses on the south side of Mapledale Avenue between Pearl Road and West 31st Street, where one of AT&T ‘s first local VRAD cabinets was installed in 2008. That VRAD cabinet is the red dot on the map below. Census Tract 1055, Block 1007 is listed in AT&T’s Form 477 block data for December 2015 as having VDSL service with a Maximum Advertised Download Speed of 75 mbps. But in fact, that high-end VDSL service (and the U-Verse video service that comes with it) is available only to the six houses immediately adjacent to the VRAD cabinet on Mapledale. AT&T’s Form 477 information regarding the company’s speed and technology in Block 1055-1007 represents a technically accurate answer to the question the FCC asked, i.e. “What are your maximum advertised download and upload speeds for the broadband technologies you offer anywhere in this block?” But it creates a highly exaggerated and misleading impression of the quality of Internet service available to 90% of the households who live there. That’s just one Cleveland Census block out of more than 1,900 where AT&T says they offer VDSL service and speed. How many consumers living in those blocks are actually being offered VDSL connections with Internet speeds of 18 mbps or more? 75%? 50%? Less than 10%? We have no idea, and neither does the FCC. But we can be pretty sure that the percentages of Cleveland households with access to AT&T wireline video service and cable-competitive Internet speeds are significantly smaller than the 35-40% of the city’s Census blocks where the FCC data says these things are offered. * CYC checked available speeds on each street using AT&T’s online availability query at https://www.att.com/shop/unified/availability.html.